Themes This user creates Homebrew Channel themes. PS2 This user has a PlayStation 2 console. NGC This user has a Nintendo GameCube console. I have a basic knowledge of wii hacking. I at one time used to downgrade/upgrade, switch from PAL to NTSC and vice-versa, test wii menu themes, create wads, and download foreign channels multiple times a day. I quit hacking my wii after i screwed up by updating, which in turn bricked my wii to the point that I had to send it to nintendo. I do plan on hacking my wii again, but not until nintendo stops updating. I have grown a liking to making HBC themes and I think thats as close as I'm gonna get to hacking my wii for now, I hope that other homebrew software developers add the ability to create custom themes. A rehash of the HBC Classic theme, modified to be orange. Same as title, credits go to Marcelofoxes, Raixs, and Selena(Xiangua) for some images. Themeshot can be seen here. 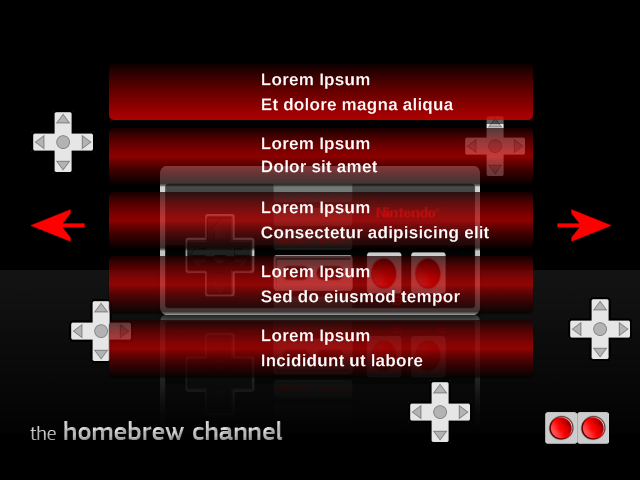 A Homebrew Channel Matrix Theme. For white text version click here. Themeshot can be seen here. Close as I can get to original HBC, I hope Team Twiizers appreciates it. Themeshot can be seen here. HBC given a whole new NES makeover. Themeshot can be seen here. This page was last edited on 21 February 2011, at 20:00.